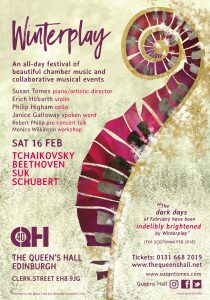 I’m preparing for next weekend’s Winterplay, my mini-festival of collaborative music at the Queen’s Hall in Edinburgh. We have a children’s music-and-movement workshop led by Monica Wilkinson, a music and words event with Janice Galloway, a pre-concert talk by Robert Philip and a trio concert. Violinist Erich Höbarth is about to arrive from Vienna and I’m so looking forward to rehearsing piano trios with him and cellist Philip Higham. I keep thinking about the observation that a career in music is 90% admin and 10% music-making. Not quite true, because one has to practise one’s instrument every day, but it certainly feels as if the work of organising concerts is vastly out of kilter with the time spent giving the concerts themselves. I find myself wishing there was a centralised concert diary where one could check what else is scheduled. Nothing like that seems to exist. I try to find out, from season brochures and advance publicity, what other concerts might whisk away my listeners on the night I need them. You might think that the music world was small enough that we’d all know about one another’s plans, but in fact there are many independent circles within the music scene. And these are only the musical events! People also mention sports events, weddings, holidays and half-term activities which no organiser could possibly factor in. But surely it would be sensible for concert organisers to have a way of checking what other musical events are planned on the date they have in mind? Bob tells me to keep calm. ‘All the people who saw your mail and thought ‘I’ll go to that’ probably didn’t bother to tell you so. They’ll just turn up.’ Amen to that. This entry was posted on Friday 8th February 2019 at 11:11am	and is filed under Concerts, Daily Life. You can leave a response, or trackback from your own site. This is how it always is when organising concerts. I agree a centralised events diary would be useful but I have often found, as Bob says, that the news you get is from people who can’t come. Let’s hope! Your festival sounds wonderful! Here in Seattle, The Live Music Project is trying to solve this dilemma. In and around Seattle, there exist more than 100 Choral groups, several opera companies, numerous symphony orchestras, and countless solo and chamber musicians, so you can imagine the challenge of competing calendars and audiences. LMP is a new group that has formed to keep musicians aware of what events are happening. They offer free publicity as part of their service and are quite active on Facebook as well as maintaining their website: http://www.livemusicproject.org. Thank you for drawing my attention to Seattle’s LMP, Cori. It sounds really useful!